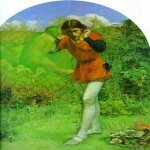 Ferdinand Lured by Ariel is a painting by John Everett Millais which depicts an episode from Act I, Scene II of Shakespeare's play The Tempest. It illustrates Ferdinand's lines " should this music be? i' the air or the earth?". He is listening to Ariel singing the lyric "Full fathom five thy father lies". Ariel is tipping Ferdinand's hat from his head, while Ferdinand holds on to its string and strains to hear the song. Ferdinand looks straight at Ariel, but the latter is invisible to him. The supernatural green bats were the last additions to the composition. Their grotesque poses put off the patron who had originally undertaken to buy it, since they were a radical departure from the standard sylph-like fairy figures of the day. They adopt the poses of "see, hear, speak no evil." The invisibility of Ariel and the bats is suggested by their semi-merger with the green background. The connection with natural camouflage is implied by the presence of the green lizards hiding in front of the clump in the right foreground. 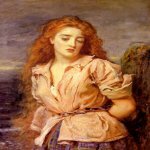 The painting was bought by the collector Richard Ellison, and later entered the collection of Roger Makins, 1st Baron Sherfield who acquired several Millais paintings. Critical reception was initially mixed. The Atheneaum stated that it was "better in the painting" than Millais' controversial previous exhibit Christ in the House of His Parents, but "more senseless in the conception". The Art Journal identified "a considerable vein of eccentricity" in the portrayal of Ariel as "a hideous green gnome". The Times condemned it as a "deplorable example of perverted taste". 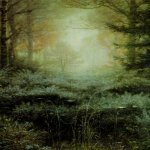 In 1998, when it seemed as though the painting might leave Britain to be sold in the USA, the columnist Kevin Myers, wrote that he would "put my foot through it" with "violent joy".